A bottle of bleach (the normal sized bottle that's $1.50 to $3 - I think it's less than a gallon but more than a half gallon). It makes a difference if it's fresh - it's worth it to buy a new bottle. Get the jeans thoroughly wet. Dripping is good - don't bother wringing them out. Set the washing machine to fill a "small" load (but big enough to cover your jeans) with hot water. As it's filling with water, dump in the bottle of bleach. The whole thing. When it starts to agitate, open it up and add the wet jeans. (It should be well mixed). I leave the washer open to prevent it from finishing the load. I just want them to soak a while. Agitate just a bit to get jeans under water, and use spoon to poke jeans down. You want them completely covered with the bleach water. Wait 30-60 minutes, and check them - agitate them a bit, poke them down again. Repeat until they're about the lightness that you want. (My white jeans were 8+ hours in old bleach, my pale blue ones were about 3 hours in fresh bleach). When they're light enough, the jeans will be yellower than you want. The yellow color will fade as they dry, and with subsequent washes. When they are about as light as you want, let the washer finish the load. Then wash it again through the full cycle twice, with no soap (this gives them a good rinse a few times). Finally, wash them with your normal detergent. Online tutorials say not to dry the jeans after bleaching them (but to air dry them the first time). I dried my light blue pair in the sunlight, and my white pair in the dryer. Both worked, and once they were dry, they weren't quite as yellow. The yellow faded even more after a wash or two also. #1 The blue ones after bleaching (and after leg alterations, fit questions below), and WIW today. #4 is the light blue jeans fit after bleaching, before leg alteration, for reference. Obviously the light is rather different in #4 and #1. 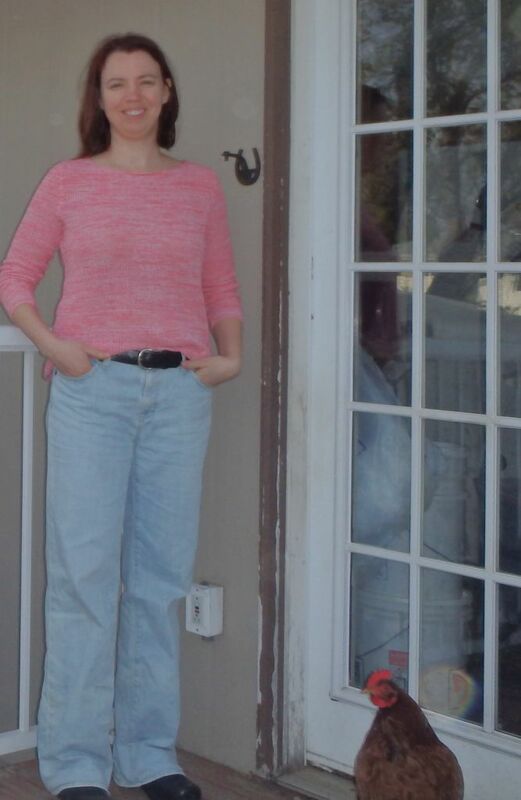 #5-#7 are closer pics of the light blue jeans, post leg alterations, for you to judge fit better. Thank you! Seems simple enough for even me to consider. This is really great I have been wanting to try a couple of projects. I actually want to try an hombre effect. Thank you. Almost forgot the fit is fab not to tight at all. Wow, that's pretty impressive that you can go from dark wash to white. I think the alterations to the light blue pair look good. You did a good job. Even the chicken ?rooster likes it. You got a nice and even bleaching. How would you go if you wanted a patchy bleached look? Just sprinkle the jeans with bleach until desired patches show up? Wow. Ok. I didn't honestly think bleaching would work, but it does. Lol! Thanks for the instructions, Amy! Wow, super fantastic job on the alterations. I think they are Just Right! They look amazing on you. Wow! I'm impressed. Great job. Loving the alterations too. The fit looks great after taking in. Just right. Thanks, Amiable. I will look for a pair of cheap jeans to try that. Maybe I will start with some old ones and see how it goes. This is very cool. There's a textiles professor at the university who has a terrifying demonstration item in his office of a pair of black jeans that were was according to label directions. They turned this hideous gray-green-yellow mottled color. He says it's because the chemicals they use to try to "set" the black dye makes the dye super unstable and unreliable. He said this is also why black jeans and other items sometimes have a hideous smell. So I guess the lesson is to not try to do this bleach technique on black jeans. Just wanted to say that I'm in awe. I will never attempt anything like that myself though (unless I'm in the mood of ruining some clothes :)). I like experimenting with clothes - and I thrift store shop, so when I ruin something, it was probably only a few dollars lost. I wonder if old-school bluing would help with the yellowing? Some white fabrics actually have a blue-white hue; bluing makes them appear even brighter, cleaner, and whiter. @ amiable I'm a thrifter also so I don't mind experimenting. I think the fit looks good, nice job with the alterations. That's amazing that the color can go from dark blue to white, and the white looks completely even, not blotchy at all. Well done! Amiable, your jeans look fantastic. Very talented. You piqued my curiosity now with my jeans. Your abilities and your adventurous nature, your fearless experiment with clothing....isn't that what fashion designers are made of?